Resistance exercise is the best way to increase body strength and muscle mass. The regular "overloading" of muscles with resistance will result in a healthy increase in size, endurance, and strength. Resistance exercise is a very important element to any serious wellness program. Resistance exercise is also important to fight the effects of aging. During the aging process, both muscle mass as and bone density decline. Resistance exercise offsets the inevitable muscle decline and stimulates bone growth activity. Increasing the body's motor power strengthens the entire framework of the body, including the joints, thus reducing the likelihood of injury from insult or overuse. Regular resistance workouts also help to burn fat, and can be an important element to weight loss. Resistance exercises can be tied together in a way that also makes weight training a cardiovascular work out. There are many ways to perform resistance exercises. The first is by joining a gym. Gyms are equipped with all sorts of resistance exercise equipment including free weights and exercise machines. An exercise trainer will usually guide a member through their first several workouts, instructing them on how the equipment is used and how to begin a strength-enhancing program. While gym workouts are probably the best way to start, there are several drawbacks. Gym memberships can be expensive and workouts can be inconvenient and time-consuming. Many gym memberships are left idle simply because people cannot find the time to get there on any regular basis. My personal preference for strength training is a home-based program. Resistance exercise can be done at home requiring only some very basic and relatively inexpensive equipment. A simple flat bench, several dumbbells, a Swiss exercise ball and a floor mat are all that is necessary. 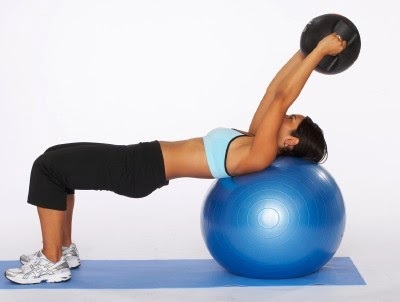 Exercises need to be geared at toning and strengthening all of the body areas including the midsection or abdominals, the muscles of the back, the chest, shoulders and arms, along with the hips and legs. Over emphasizing a body area, for example the arms, is not very helpful. The entire body needs to be addressed. Resistance exercise programs are best started with light workouts. The weight of resistance should be well below the participant’s full capacity. Starting with, or adding too much weight too quickly can tear the muscles and joints, leading to serious injury. The amount of resistance is gradually increased with time as the body accommodates to the workouts. In a relatively short period, the body will show signs of increased muscle definition, better muscle tone, as well as increasing endurance and strength. Bookstores and libraries are filled with publications related to fitness, resistance exercise and weight training. Find a book that appeals most to you, and get started.